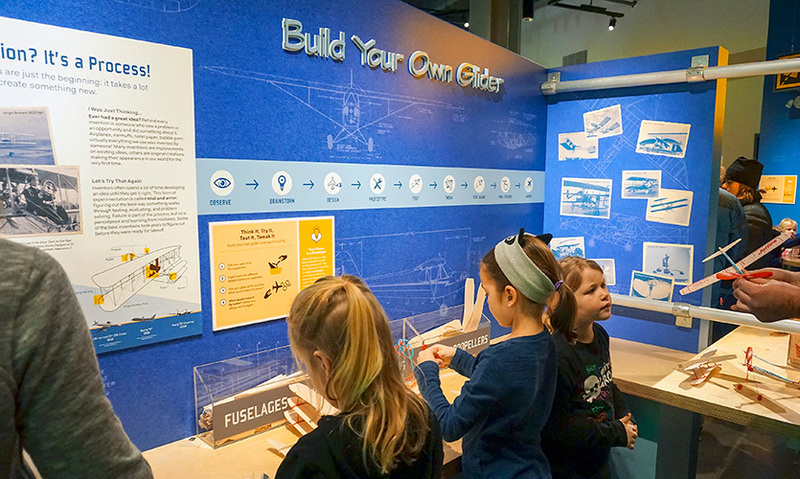 The Flight Gallery welcomes visitors into a three-dimensional graphic world, where aircraft blueprints and designs come to life. The Gallery relies on aircraft hangar iconography and colours. In addition to the large paper airplane entry icon, paper airplanes appear overhead in a dazzle of various shapes and sizes, mimicking birds, insects and real aircraft. Stations within the gallery are themed to resemble aircraft maintenance facilities and equipment, and feature themed graphic imagery, type and iconography. Visitors here build their own test planes. Bright red toolboxes were used to identify stations around the Piper Cub aircraft where messaging about the aircraft and its various systems is highlighted, along with an associated activity. Visitors interact with hands-on STEM-based activities distributed around the gallery, and associated with science-related themes and messaging. This Bernoulli blower reveals how air currents flow. The gallery features backlit station identifiers themed to resemble aircraft hangar safety signage. These were custom designed and included a series of unique icons that relate to activities below. The blueprint pattern and design motifs are used to distinguish the gallery from adjacent galleries, through a variety of mural graphics, wall patterns and the intro icon. Digital media design also relied on the blueprint and aviation theming, which allowed the on-screen visitor experience to thematically parallel the physical setting. 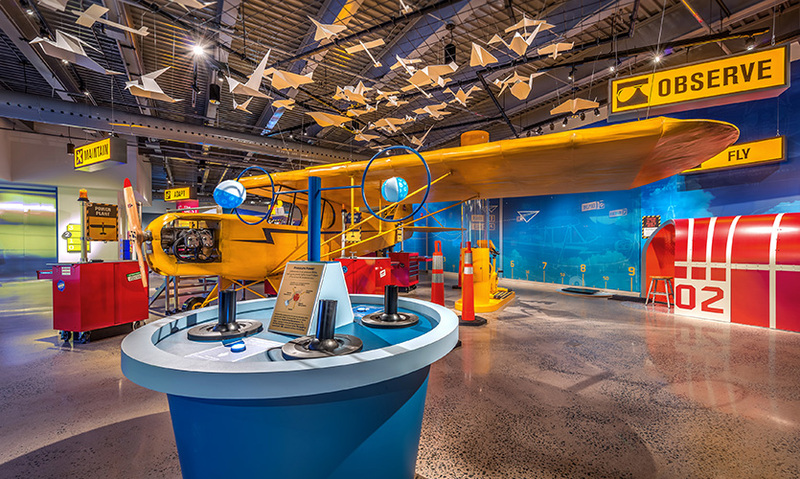 Designed by AldrichPears Associates, this flight-themed science gallery is a permanent exhibit at the new waterfront home of Discovery Centre, Nova Scotia’s hands-on science center. 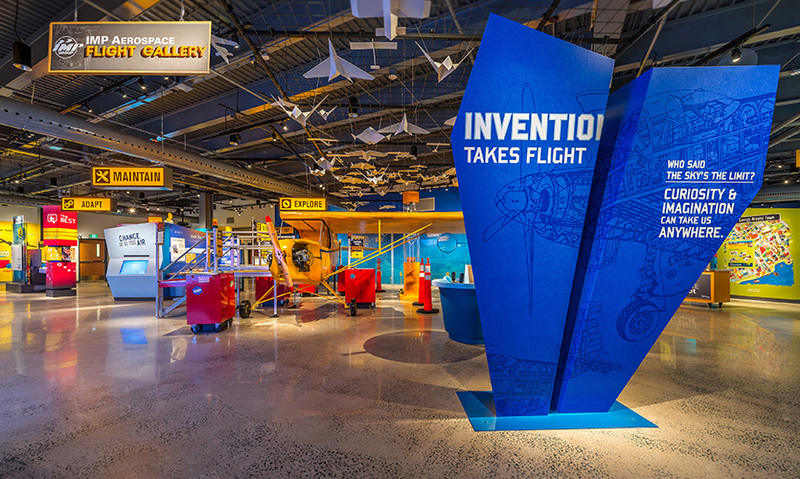 The Flight Gallery explores invention and innovation through the lens of flight and aircraft maintenance, and features open-ended exhibits that encourage visitors to experiment, test and re-try to learn more about how the world works through a science-STEM lens. 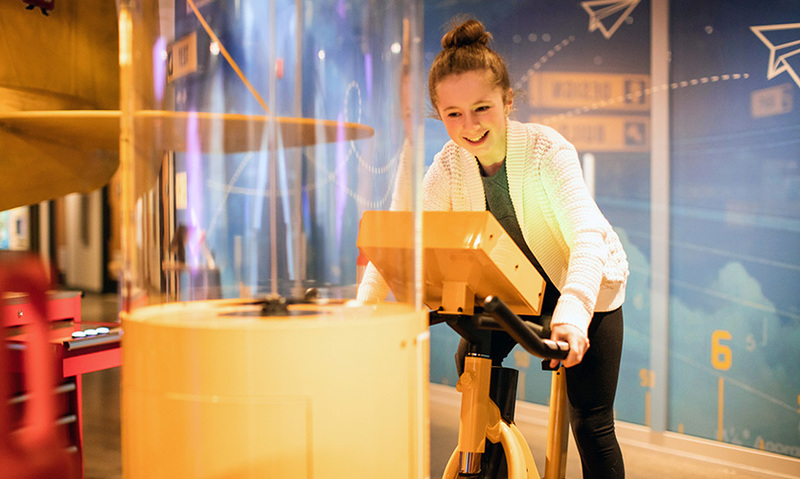 The key objective of the Flight Gallery is to immerse visitors in the process of invention while incorporating stories of local science, industry and aircraft systems maintenance in particular. These gallery-specific goals tie into those of the new facility. Discovery Centre aims to demonstrate that Nova Scotia is a good place for science and to inspire visitors to think for themselves: to question, probe, evaluate and problem-solve. Gallery identity was an important design consideration for the AldrichPears Associates team. The Flight Gallery is sandwiched between two other galleries—Health and Energy—with no architectural threshold between them. Each gallery needed a unique look and feel in order to visually distinguish it and to create a distinct experience for visitors. The challenge was to create variety while allowing each space to fully express its themes and character. 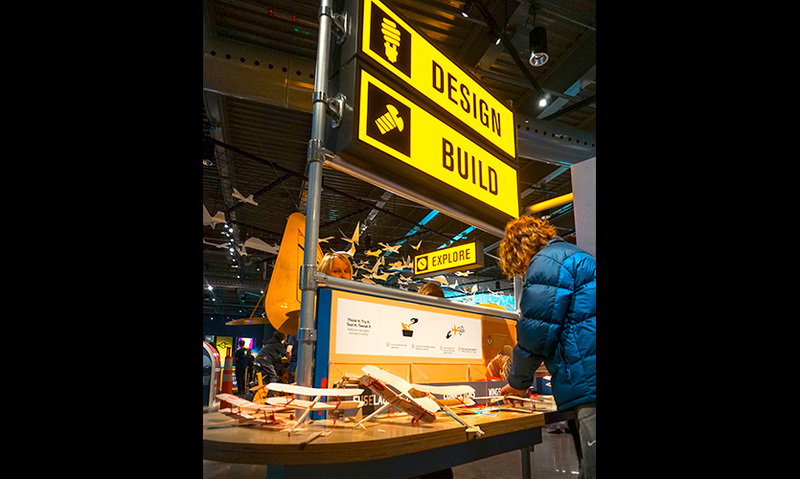 The gallery was earmarked as a flight-science gallery, but the team at Discovery Centre also wanted to engage visitors in concepts of innovation and invention. The design approach needed to balance these aspects in a small space, using a combination of visual and three-dimensional design elements that also communicated aerospace themes. The AldrichPears Associates design features a full-scale aircraft. While a real aircraft is a compelling icon, it presented design challenges. How do visitors engage with the aircraft? What story does it tell? How does the rest of the design frame this piece of the exhibit without being overpowered by it? The exhibit needed to communicate that fun, play and curiosity are at the heart of invention, and to invite visitors to participate. A fleet of suspended paper airplanes introduces visitors to the gallery. Symbolizing human imagination and the idea of play that is at the heart of experimentation, the paper airplane is a recurring motif. The AldrichPears Associates design team referenced scaffolding, toolboxes, technical manuals and backlit safety signage in the exhibit structures and graphic approach. The colors and shapes are familiar and eye catching, but with a spirit of fun. The Piper Cub aircraft is deconstructed as one might find within a blueprint or technical diagram. Portions of the aircraft are revealed like a cutaway diagram, showing visitors the engine, structure and materials under the skin. The full cockpit and engine assembly remain accessible for visitors to climb inside. As a central gallery within the Centre, Flight draws a high volume of visitors of all ages who clamber and experiment with the many tactile exhibits and the Cub. The AldrichPears Associates design presents the science messaging of the Centre and its industry sponsors, while providing a playful and graphically dimensional environment for ongoing STEM learning. "Having a nine-year old son, I imagined he would not only love this exhibit but would be willing to stand in line to see it. 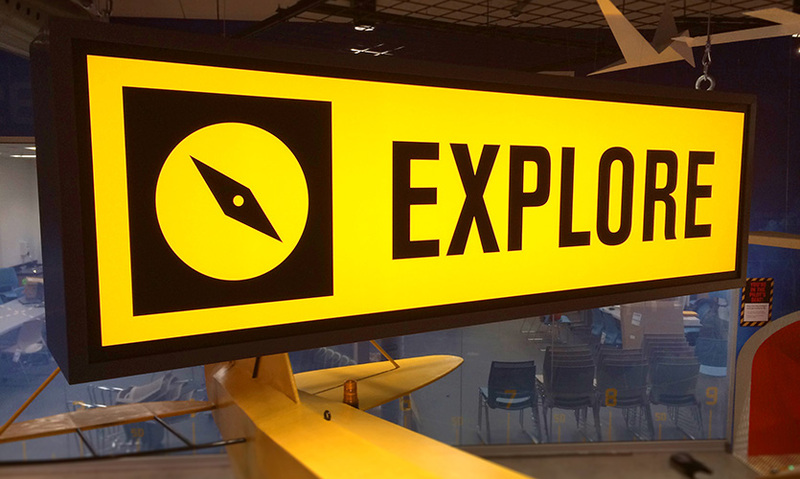 A great use of all levels of the exhibition space with every square inch promoting exploration and learning though physical interaction, and easy-to-understand information graphics and instructions." "The Flight Gallery does everything really well, from design to experience to visitor engagement. 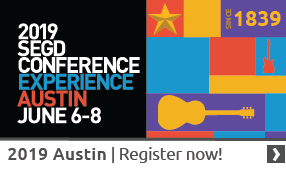 A very nicely executed example of great exhibition design."